To park a call, touch the menu in the lower right corner and choose Park Call. You can choose to park the call against your own extension or enter another extension to park the call against. 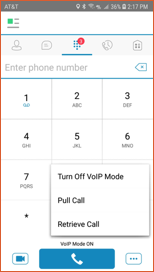 Enter # to park the call against your own line or enter the extension of another user to park the call to. If the call goes unanswered for too long, the system will ring you back with an incoming call. 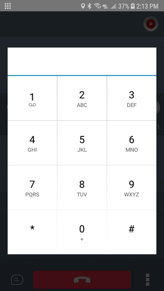 To retrieve a call, go to the calls tab and touch the menu in the lower right corner. Choose Retrieve Call from the menu. When you hear the prompt asking you to enter the extension, enter the # digit if the call was parked against your own extension, or the extension number that the call was parked against followed by #.